Last week I guest posted at My World - Made By Hand. 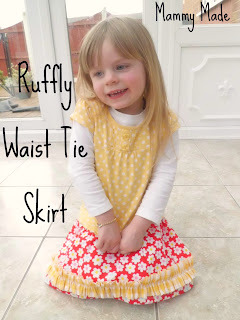 It was my first ever guest post and I really enjoyed it :) I shared my Ruffly Waist Tie Skirt that I made for Leyla to wear for Easter. Didn't it turn out so cute! I love it! 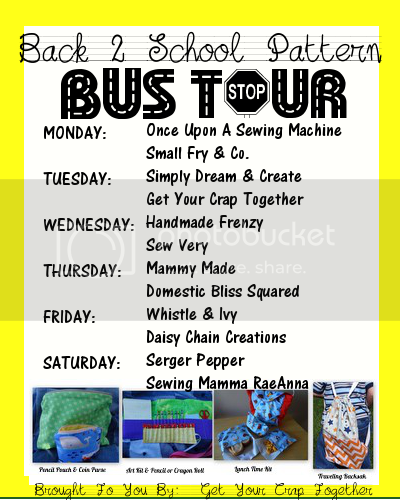 Do you want to learn how to make one? First of all, take your little girl's measurements. 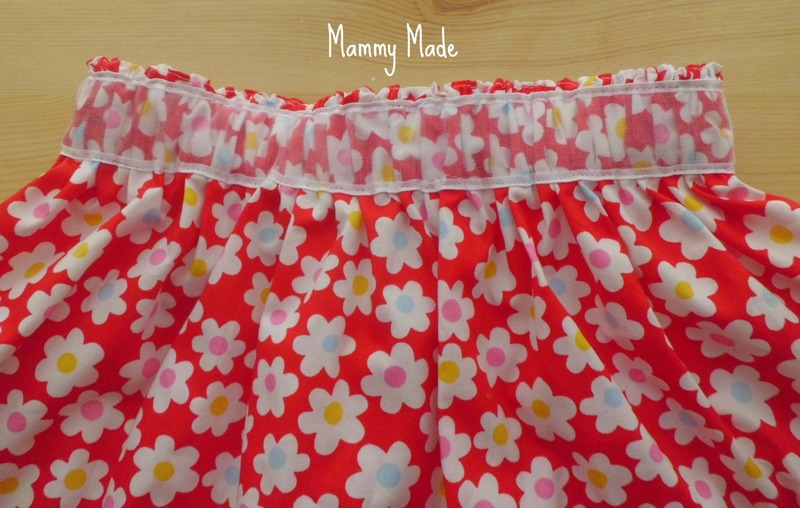 Mine were 20" waist and 11" waist to knee for my skinny 3 year old. These are the measurements I will be using in my tutorial today but I will show you how to easily change this to your measurements. Second, add 3" onto your waist to knee measurement. This is the length. The width will depend on how wide your material off the bolt is. Mine was 44" for the main piece and 58" for the ruffle. 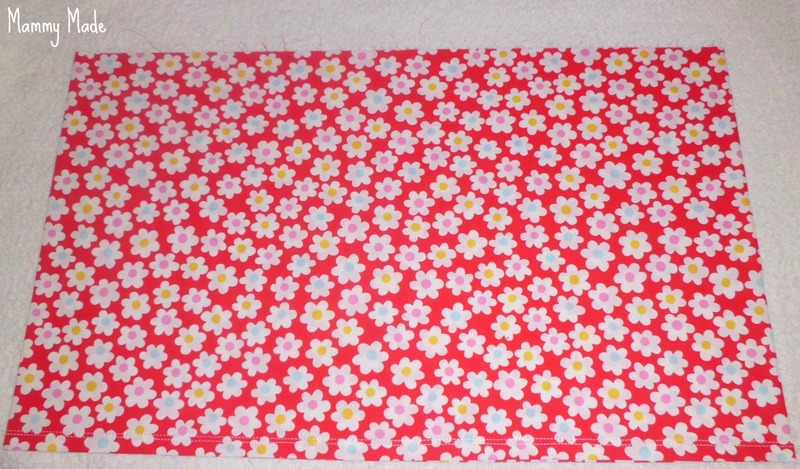 I didn't think you could get 58" wide material but apparently you can! Cut the selvages off the large piece. This took my material to 43.5"x14". Fold the two short ends right sides together and stitch with a straight stitch followed by a zigzag stitch in the seam allowance. Oh, speaking of seam allowances, I always use a 1/4" seam allowance. It makes it much easier to just line my material up with the edge of my presser foot. I find I get much neater lines if I do it like that! Make sure you backstitch a few stitches at the beginning and end of your line of stitching. You will end up with a tube of material. 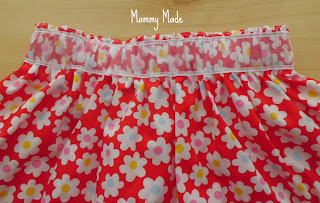 Make the hem on the bottom of your skirt. I always struggle getting perfect hems so I have come up with a cunning trick to make sure they are always perfect. I usually fold over 1/2" then another 1/2" so all raw edges are enclosed. To make sure I get this perfect, I take my washable marker and my long ruler and I draw a line 1" above the raw edge, all the way around. I then fold my raw edge up to meet the line and then over again, iron it down, and there I have my perfect hem. I like to stitch it with two lines as it looks more professional that way :) Remember to backstitch a few stitches at the beginning and end of each line of stitching. 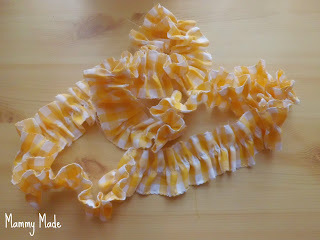 To make your ruffle, cut your width x 4" material in half, lengthways, so you end up with two width x 2" pieces. Stitch the short ends, right sides together, with a straight stitch followed by a zigzag stitch in your seam allowance. You should end up with a really long, thin tube. Zigzag around both of the raw edges. You want one side of your zigzag to be on the material and the other side to be over the edge. This will stop the material from fraying. I went round both edges twice, to make double sure they wouldn't fray. 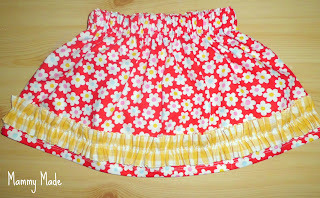 You don't want to get your skirt out of it's first wash and realise your cute little ruffle is ruined! Set your stitch length to its longest then do a line of stitches right down the middle of the tube, making sure NOT to backstitch at the beginning and end of stitching. 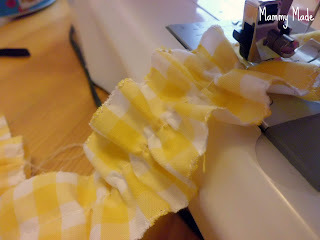 A nice little trick when making ruffles is to set your tension to the tightest, then stitch as above. Your fabric should automatically ruffle. Depending on how long your material is, you may have to further tighten it (I did because mine was especially long) but this way takes most of the work of ruffling out for you! To attach your ruffle to your skirt, you want to mark the four quarters on the skirt and on the ruffle with pins. 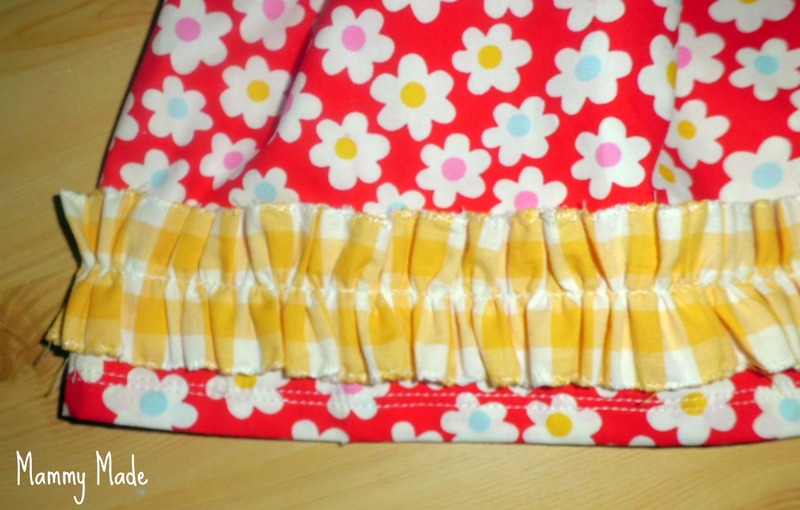 Match the pins, adjust the ruffles if needed then stitch down. I stitched mine just a little bit above the hem lines. Make sure you readjust your tension! I nearly didn't. 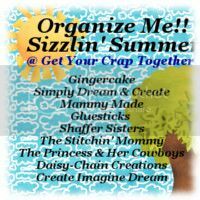 I know a lot of people like to unpick their basting stitches once their ruffle is sewn on but I don't bother. I just try and line up the two rows of stitches as well as I can. Nearly done :) Now you need to make your waistband. 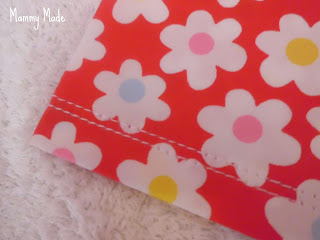 I used 1" wide elastic cut to my 20". To make the casing, you will need to fold over 1/2", iron down, then fold over another 1-1/2" and iron down. 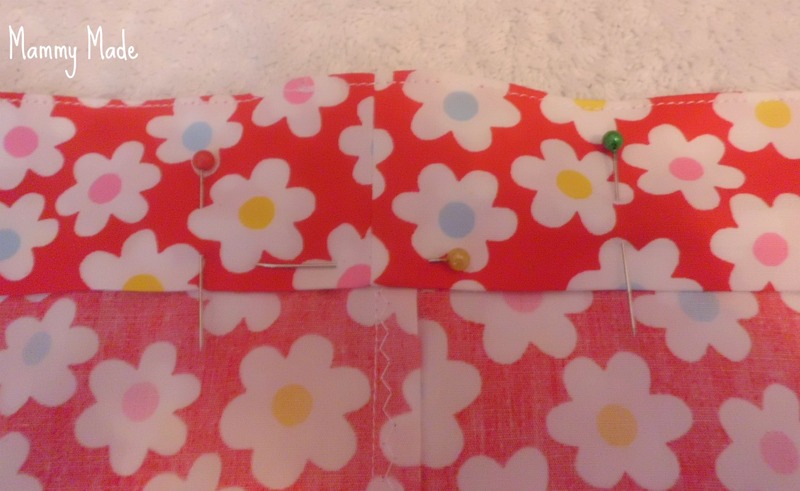 Pin down and then stitch as close to the top of your waistband as you can get, remembering to backstitch at the beginning and end of your stitching. 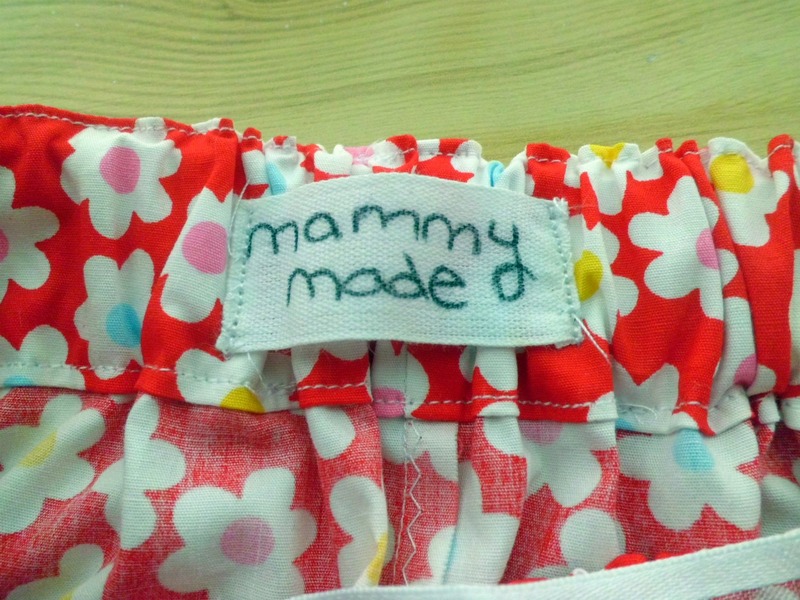 Mark two points on your casing, preferably at the back seam, to insert your elastic through. I used a red pin and a green pin because I'm a geek like that. Start sewing at your green pin, remembering to backstitch a few stitches. Sew all the way around your casing, as close to the edge as you can get, until you get to the red pin. Backstitch! I know I've said it a lot but it's important to stop your stitches unravelling. Take some 1" elastic and cut it to your waist measurement. For Leyla this was 20". Attach a safety pin to one end of the elastic then insert it into the casing, Use your fingers to guide the pin around the casing until it comes out the other side. Overlap the elastic 1" and stitch together, making sure it is not twisted. 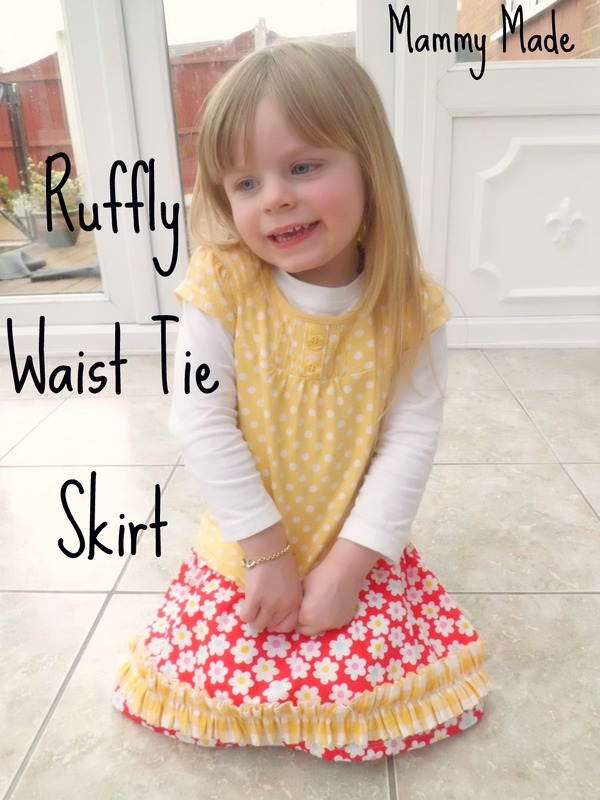 Rearrange the gathers and try the skirt on your little girl. If it fits then great! 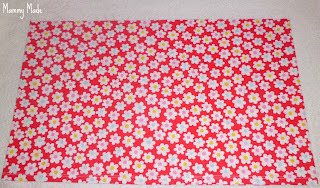 If not then you will want to unpick the stitches on your elastic and shorten/lengthen it slightly. Next you will want to stitch the opening in the casing shut. Pull the fabric tight and stretch the elastic. Make sure you do not stitch the elastic down when you're sewing or it will not gather! 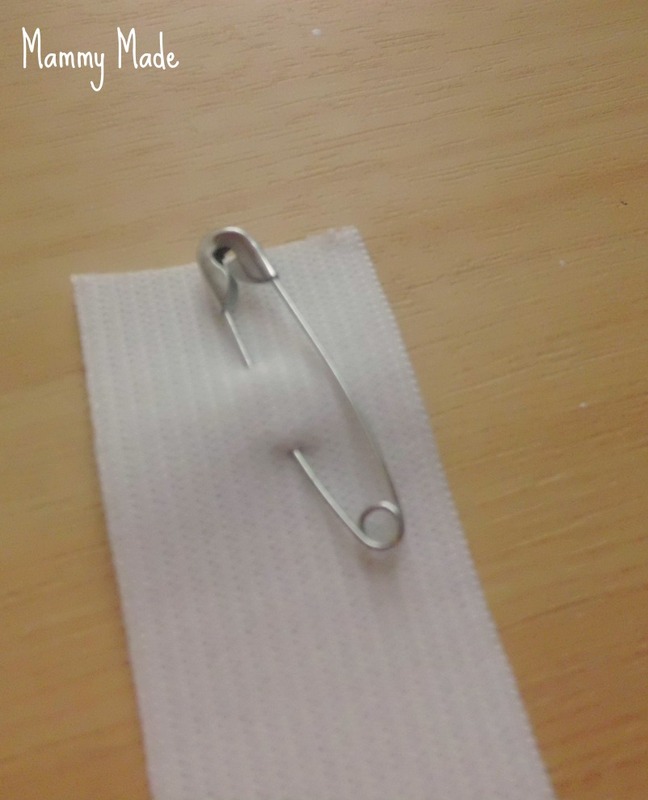 I learnt this the hard way back when I started sewing. Attach a label if you have one. I made mine out of cotton tape, a laundry marker and my iron! Nice and simple and it adds a professional touch. Looks cute already, doesn't it? You could leave it like this if you wanted. I wanted to add a little bit more cute factor though and what better way than with a bow! 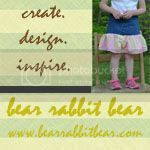 To make sure my ribbon was in the right place, I put the skirt on my little girl and tied the ribbon around her waist and into a bow. I made sure it was sitting right, then checked where the sides were on the skirt and pinned the sides of the ribbon exactly where I wanted them to fall. This makes the ribbon a bit gappy on the front when it's not on, but it needs that gap to stretch with the elastic when the skirt is on. 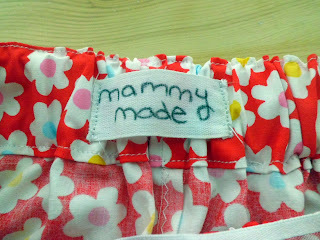 I pinned two sides and one in the front, then I stitched two lines of straight stitch down the sides of the waistband. I wasn't going to stitch the front because I thought it might look a bit messy but the ribbon kept sliding up so I had to in the end. It looks really nice though and I'm glad I did it. 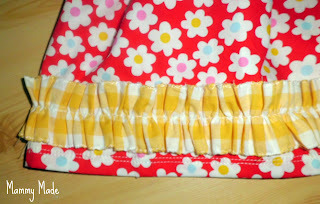 I just stretched the elastic out to match the ribbon again and sewed along the top and bottom. 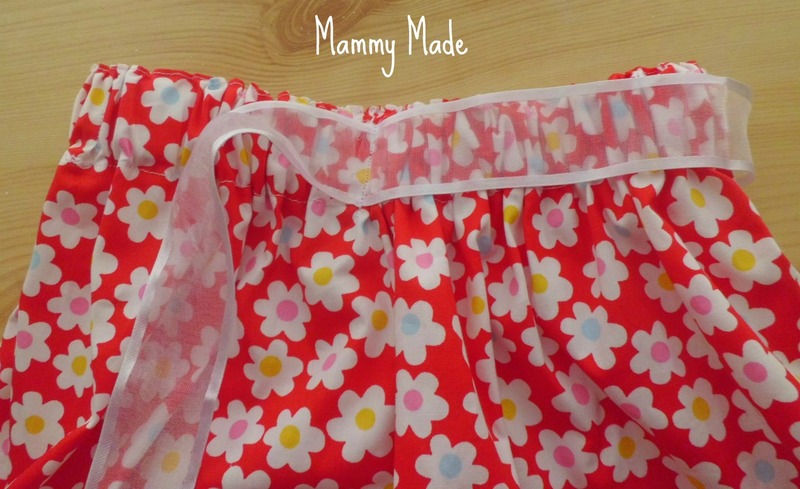 I think it looks quite fancy because it slightly ruffles the ribbon to match the waistband! Awwwah! SO Cute! My mom used to make my clothes when I was young and I loved it...being able to tell her what I wanted, pick out my own fabric and she would make my dream come true...such a great skill and talent to have. Your daughter is lucky that you are so good!! CUTE! 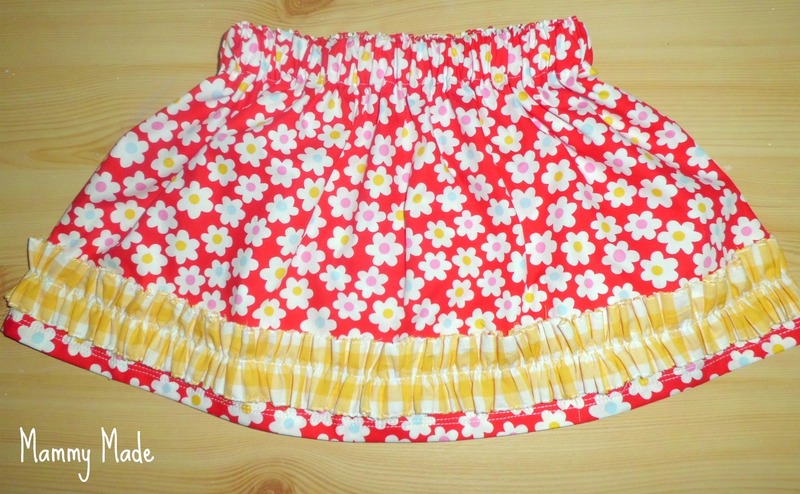 I've made skirt similar using 2 fat quarters - next time I'll have to add the ruffle! How cute! 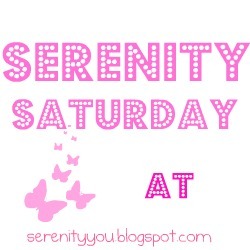 Please link up to my Saturday BYOB Party over at Honestly, Dyea. What a gorgeous skirt! 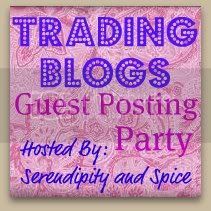 I'm following your lovely blog too. I'm also part of the contributing team over at My World-Made by Hand - I think we should all support each other and I'm off to visit the other blogs and say hi. So cute! Thanks for linking to Things I've Done Thursday! Recycle plastic bags into a reusable bag!